YISS is a different program from Yonsei’s KLI (Korean Language Institute) in that it’s a summer school (for high school graduates/undergraduates) that offers a wide variety of courses in English. They have general business/science/humanities courses and also courses that are Korea related (Korean films/culture etc). Of course, they do offer Korean language classes but these are not compulsory. We share the same teachers/textbooks/classroom materials etc. However, KLI classes are conducted in the morning, while we have ours in the afternoon. Compared to KLI, the lessons are less intensive (since we meet for fewer class hours) but the pace is similar. I have never attended the KLI program, but hopefully the review will be helpful to those who are thinking about going there. We are asked to sit for a placement test a few days before the start of lessons. For those who have no background in Korean at all, they are allowed to skip the test and they will be allocated to Level 1 straightaway. The placement test consists of a written test and a ‘interview’. We are assigned to random classrooms where we take the written test. 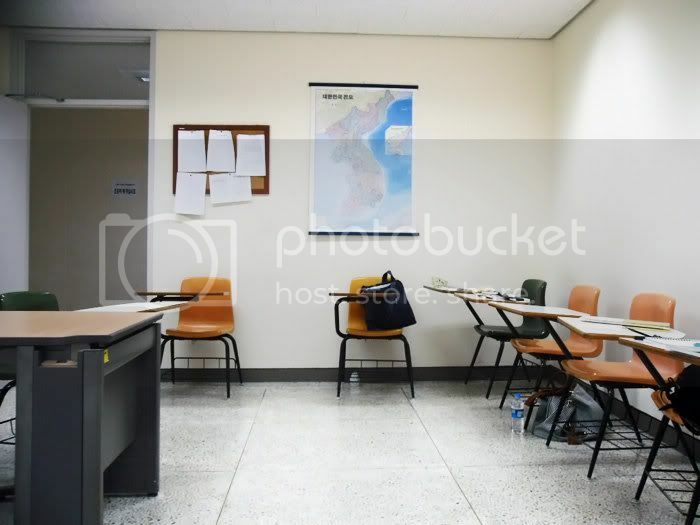 During the written test, we’ll be called into another room for the interview one by one. The placement test is similar to TOPIK, and the questions are arranged in order of increasing difficulty. There are MCQ, short answer questions and a short essay (response/discussion of a short article). Students are asked to complete as much as they are able to. As for the interview, it’s a one-to-one with a KLI teacher. They will have a long list of questions, which are arranged in terms of difficulty (level 1-6). The teacher will start out with the simple questions and progressively move on to gauge your standard. Just relax, and answer the questions. A bad bout of nerves won’t help since you wouldn’t want to be placed in a level lower than your real standard! I can’t remember if there’s a time limit, but we are allowed to leave once we complete both components. A few days later, the results will be posted on a bulletin. I was placed in Level 6. The accuracy of the placement test is disputable: if you feel that you’re being placed incorrectly, please let the teacher know on the first day of lessons! Level 1 students are further split into 3 classes according to their proficiency (ability to read hangul etc). I have no idea how the classes are like in the rest of the level, so I’ll just review my experience in the Advanced 2 class. The class size is relatively small (less than 20) and gets progressively smaller as the level increases. My class has only 7 students and I was the only foreigner. The 1.5hr of class time is split into 3 sections: Reading, Grammar/Vocabulary, Writing. The first section is taken by a different teacher. There’s no specific time allocated to speaking, but we are always engaging in discussion during the class. The 한국어 읽기 6 textbook consists of long passages with reading exercises. We take turns to read aloud each paragraph. After each paragraph, the teacher will go through difficult vocabulary and also discuss the topic in the text. There’s no rigid format and often, we sidetrack to related topics. The discussion is really engaging and it helps to form an in depth understanding of the passage. Somehow, the vocabulary becomes really easy to absorb. We don’t actually write much in class. The textbook which we used is really challenging and the vocabulary are tough. It may be a little overwhelming for those who have never taken intensive Korean classes. However, the teachers are really thorough in their explanations and we are encouraged to voice our questions during the lesson. Yonsei KLI programs are famous for being grammar and vocabulary intensive and I agree. It’s a thorough program for those who are looking into studying/working in Korea. However, for those who aim to be conversational in Korean, I feel that this may not be a suitable program. Those who have been placed in the lower levels told me that the classes are really too overwhelming for them and perhaps they do not have enough interest and passion to spend more effort in the lessons. Personally, it helps to prepare for the lessons beforehand, so that you can understand what’s going on. YISS attracts students from all over the world, but 50% are Korean-Americans who are returning to their native country for the summer break. Alot of them sign up for Korean classes too, and the higher levels are usually populated by them. This can be an advantage or disadvantage, depending on how you view it. On one hand, you have practice partners (since most of them are fluent in speaking) and on the other hand, it increases your stress level, knowing that they are way better than you although you are all in the same level! Read and write Hangul proficiently. Understand the fundamental system of pronunciation and pronounce initial consonants, medial vowels, and final consonants correctly. Understand and apply fundamental rules of sentence structure and syntax. Have a good command of basic conversational Korean, including greetings, self-introduction, ordering food, purchasing goods, asking for directions, using public transportation, phone conversation, etc. Build upon the foundation obtained in Level 1 by learning pronunciation and phoneme rules to correctly pronounce words in the sentence. Correct construction of complex and compound sentences. Appropriate use of formal, informal, and indirect speech. Learn to communicate freely in daily life and, to a certain extent, deal with everyday matters. Can understand conventional Korean culture. Develop vocabulary on the topics of food, postal service, transportation, phone communication, vacation, and household chores. Develop communication skills to live with relative ease in Korea. Practice communicating opinions and correctly expressing ideas through assigned three minute speeches and role playing. Actively understand stories structured in paragraphs and the relatively complex context of conversations. Correctly use grammar and vocabulary to convey personal ideas through prose composition. Use grammar learned in Level 1 through Level 3 as a basis to create varied expressions. Expand the breadth of not only common vocabulary but also Sino-Korean vocabulary, and thus better understand Korean culture and way of thinking. In addition to daily conversation skills, students will be able to write and speak in length and specifically about personal opinions on familiar topics. Listen and understand conversations and writings that are relatively long and diverse in content. Read and understand to acquire knowledge about Korean society and culture. Chapter 4. Contemporary Korean Culture. Logically and skillfully convey opinions on academic and professional discourses in the arts, humanities, social sciences and science. Understand and articulately respond to current events and topics found in the news and newspaper articles. Appropriately use vocabulary and expressions that convey the speaker’s feelings and emotion when relaying information. Understand Korean values on language &education, work &leisure, science &technology, the economy, mainstream culture, tradition, nature &the environment, and family &society. * Elective classes: Chinese Characters, History, Political History, Newspaper, Reading, Literature, Essay Writing, etc. Able to use Korean grammar freely in complex and professional settings. Expand vocabulary and understand Korean ways of thinking through professional resources informative of Korean society and culture. Obtain vocabulary skills that enable understanding of lectures in Korean at the college level. Develop vocabulary needed to understand Korean culture and way of thinking, speak on broad topics, discuss societal problems, and understand Korean history.